The 5th World Internet Conference will be held in November 2018 at the river town of Wuzhen in eastern China's Zhejiang Province. The theme of the conference is creating a digital world based on mutual trust and collective governance. The conference will focus on the exchanging of ideas, mutual learning and cooperation, thereby creating a safer world as well as facilitating cyberspace development. The forum will mainly cover topics such as artificial intelligence, 5G, and the digital Silk Road. To further understand the ongoing revolution in China's technological space – especially in 5G – let's take a deeper look. Early this year, an Analysys Mason report which ranked 10 countries on their 5G readiness mentioned that China, South Korea, the U.S., and Japan are currently the leaders in this space. China has a slight edge in this direction because it has all the essential elements: wireless carriers that are committed to the technology, huge government support, the commitment to making spectrum available for 5G and a clear road-map for implementation. This next generation technology is at least 10 times faster than the current 4G technology and is expected to power self-driving cars, the streaming of virtual reality games, the interconnectivity of devices (Internet of Things) etc. This will dramatically change the way the world works. 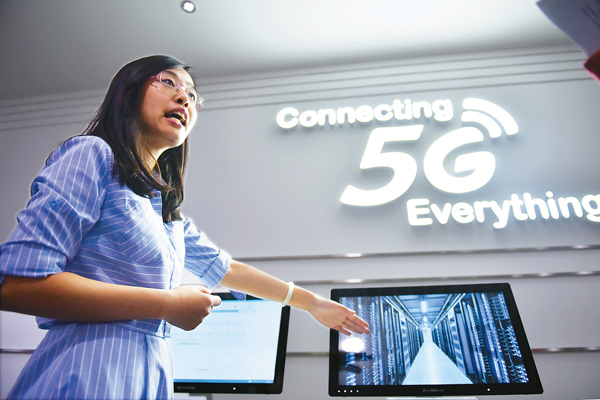 Already, China has nearly completed the third-phase of 5G tests and is all set to commercialize the technology as early as next year. China's three major telecommunications operators: China Mobile, China Telecom and China Unicom are also ready to build their scaled experiment networks. China Mobile started its pilot work at an industrial park in Suzhou in June last year with the construction of 10 experimental base stations. This year, it plans to expand further to 100 base stations in Suzhou after getting regulatory approval in order to test network performance on a much larger scale. Simultaneously, it will set up its 100 base stations in other pilot cities: Shanghai, Wuhan, Guangzhou, and Hangzhou. The company intends to push commercialization of 5G technology that will support drone technology, long-distance medical treatments and robotics etc. in 2019. Additionally, Huawei, a major Chinese telecom equipment provider, has also been working in this direction. It is the first company to complete a 5G standalone functional C-Band test of New Radio based on the 3GPP standard (3rd Generation Partnership project). 3GPP is a collaboration of telecommunications standards associations, known as the Organizational Partners. It governs the development and maintenance of GSM related 2G, 3G, 4G, and next-generation 5G standards and evolved IP multimedia subsystems (IMS). Since 2013, Huawei alone has spent more than $600 million in 5G research and is committed to spending another $600 million this year. It has been testing 5G equipment with European telecom operators including BT, Deutsche Telecom and Vodafone. In 2017, Chinese companies, such as Huawei, ZTE etc, had already owned 10 percent of the 1,450 patents essential for 5G networks, and this figure is still growing. According to the China Academy of Information and Commercial Technology, the number of 5G users is expected to reach 4 million by 2020 and 428 million by 2025. Furthermore, a Qualcomm report stated that the booming 5G technology is also expected to generate $3.5 trillion in output and 22 million jobs in the global telecom industry by 2035. Although the emergence of 5G will accelerate the development of the Internet of Things, Artificial Intelligence, Big Data, and Cloud Computing, its commercialization faces some challenges. The returns on investments, the availability of core components, and achieving self-sufficiency in critical components such as chips are major challenges in China's 5G development. Huge initial investments of more than $174 billion and higher network maintenance costs have also created concern among the network operators. In spite of all the challenges, China continues to make big strides in 5G development. According to a Deloitte report published earlier this year, China built 350,000 new sites since 2015; and the installation cost of the equipment necessary to add carriers to 5G is 35 percent cheaper in China compared to the cost in the U.S. According to the report, the early adopter countries of wireless communications technologies are expected to get "disproportionate gains," as they can exploit huge untapped economic opportunities. With the massive investment in 5G infrastructure and the emphasis on 5G development by the government, mobile operators and equipment makers, the 5G market in China is heading towards a bright future. According to the Business Insider, the development of 5G could generate 8 million jobs, and add 2.9 trillion yuan in economic value by 2030. With the increase in the demand of 5G related services among consumers, the country could see a huge increase in the number of new companies, employment opportunities and equipment sales. 5G is a powerful force which will foster new innovations and disrupt many industries from city infrastructure, industrial automation to entertainment and transportation. Looking at the current trend on 5G research and the race towards its commercialization, it can be said that a whole new wave of innovation and digital economy is yet to be witnessed. China's rapid development towards 5G technology will likely create 8 million jobs by 2030 and radically transform the communications landscape.